Hero Expansion #1 contains: 4 New Heroes with matching character cards, and 6 new Global Effects cards to add to the Darkness Spreads deck - creating more challenges for the players to face. Swiftness Spell – Discard a hero card and move to any location matching the color of the card. Chaos Manna – When fighting on a tainted site you can add +1 to the roll but any hero there (including you) are hit with a natural one roll. Friends in Low Places: Draw an extra card when ending a turn in an Inn plus choose 2 colors in an Inn rather than just one. Dungeon Delver: Add 1 extra dice to Quest rolls. Minor Quests: When the Adventurer ends her turn on a location with a Treasure Chest icon you roll 3 dice and gain 1 Hero Card for each 5 or 6. Sneak Attack: Discard one minion on first attack in a space. Shadow Walk: Use last action to disappear and at the start of her next turn you appear up to three spaces away. Battle Steed: Travel two spaces with one action and roll 1 extra die in combat on the first attack at each location. Military Strategist: Call a color when you draw a darkness spread card and only add one minion maximum from that color. Command: You may give actions to other heroes that they use on their next turn. The Chaos Wizard: Can move rapidly which is crucial in the game. The Untamed magic ensures that you have no wasted actions but it is dangerous and not reliably effective. Adventurer: Good theme comes through and having extra cards to manipulate is good fun but you have to know what you want to do with them. Assassin: Very powerful character that fittingly is deadly with the automatic hit in first attack. Disappearing allows for rapid movement if you plan ahead. Captain of the Guard: Another very powerful character that can move and attack with ferocity. Command ability is fantastic in ensuring there is always a valuable action to take. Even the Military Strategy is regularly powerful by limiting the orcs’ and demons’ ability to hit the realm. Overall: While certainly not essential, if you love Defenders of the Realm you are going to enjoy these characters and cards. The expansion is a bit expensive but the quality of the components is high and augments a fantastic game. This expansion gives you just what you would expect and it is hard to imagine someone who was interested in it being disappointed with this solid addition. This expansion adds 4 more characters to Defenders of the Realm: Captain of the Gate, Assassin, Adventurer and Chaos wizard. The box came with the hero cards and their respective miniatures, as well as a bunch of global effect cards. It is worth mentioning that the box also comes with a new Paladin miniature that is larger than the original. First of all, the new heroes are very interesting and offers a lot of variety to the base game. My favorite new hero from this expansion, is the assassin. She is arguably one of the strongest hero in the game. Captain of the Gate, adds a lot of strategic planning perspective to the game as he can let other players spend his unspent action tokens, and he has a nice attack bonus too. The chaos wizard, is a very interesting character, he is like the wizard from the base game, except that all of his abilities require card to activate, and sometimes it might cause him damage. The adventurer, can have up to 14 cards in the deck, and has added bonus when doing quests. Overall, this is a good expansion, and will provide more variety to the base game. 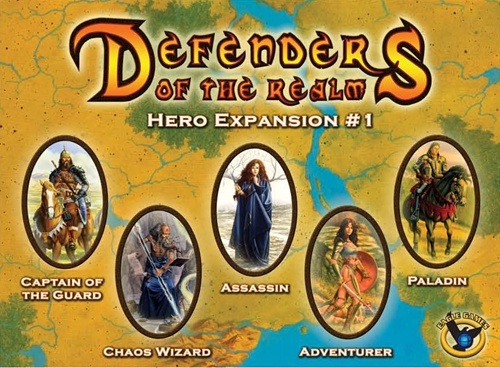 Add a Review for "Defenders of the Realm: Hero Expansion #1"